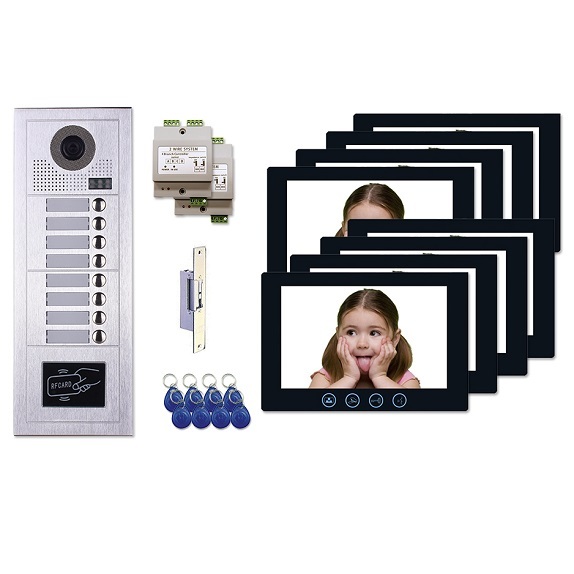 The MT Series Video Entry Intercom System is our two wire single tenant / commercial use video intercom system that requires a maximum of two wires from each video monitor to be run back to the central termination point. 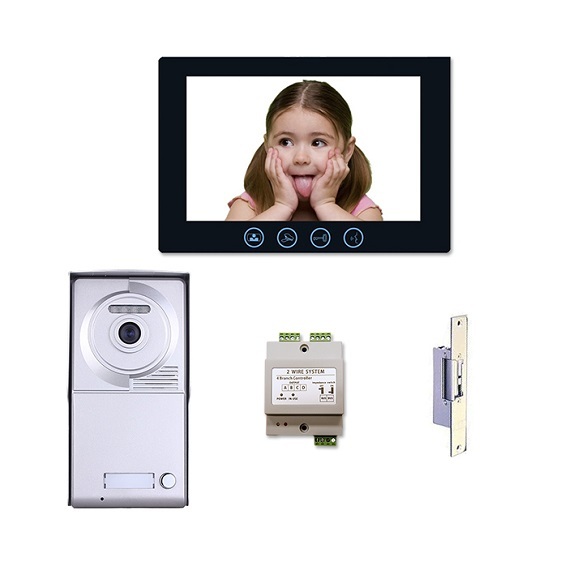 The two wires will accommodate video, intercom, power, and door release. 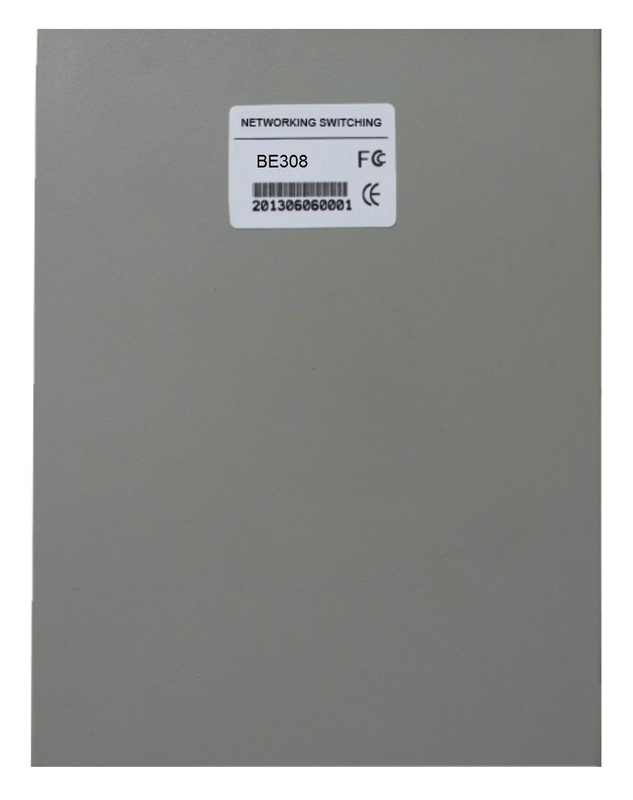 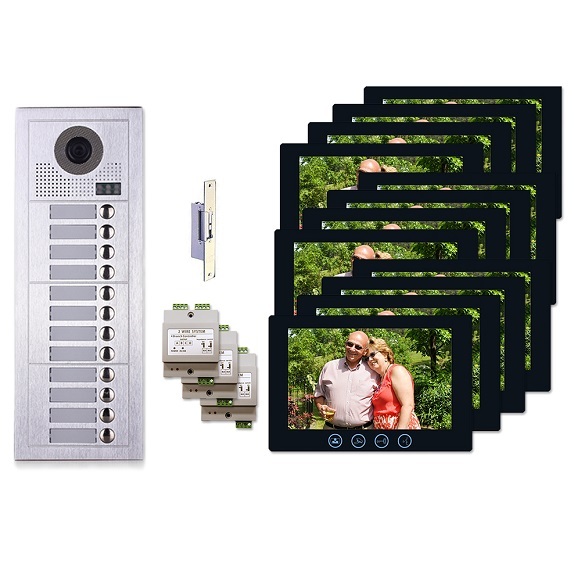 This system requires a minimum wire size of 18awg with a maximum length of 98 feet per video intercom monitor station. 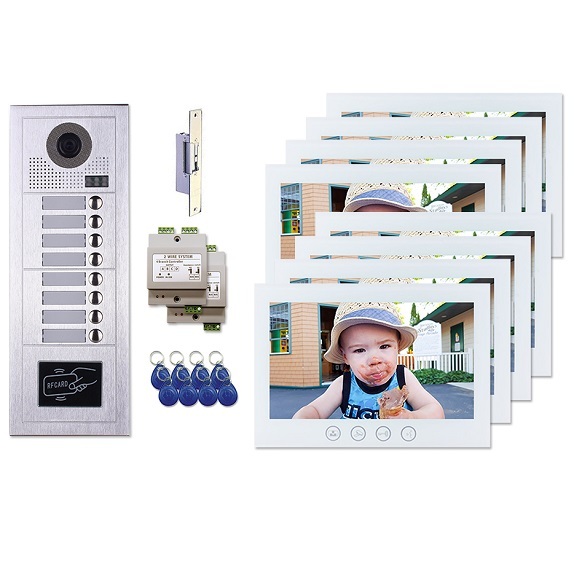 The two wire single tenant video intercom system can often be an upgrade or a replacement for an older voice only apartment intercom system. 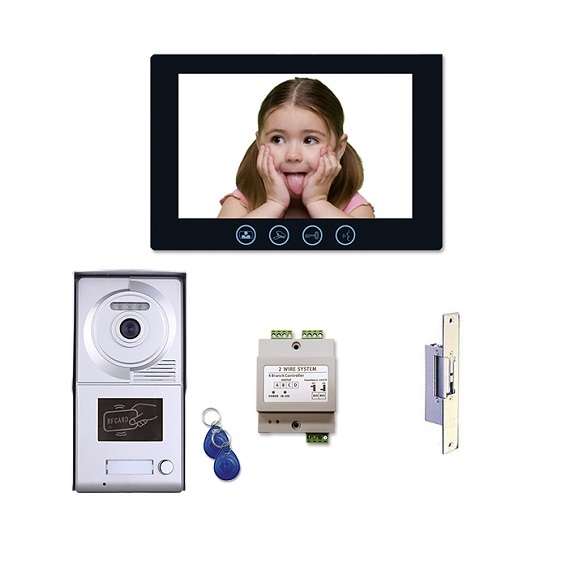 Doors or gates can be secured using the two wire single tenant video intercom system. Using a video entry system is a secure way to allow only the right people to enter a building or property once they have been visually identified. 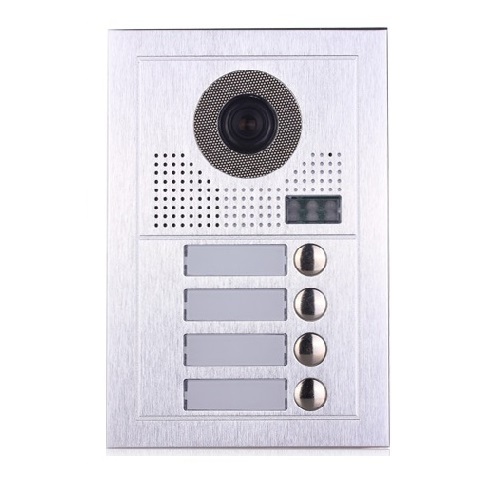 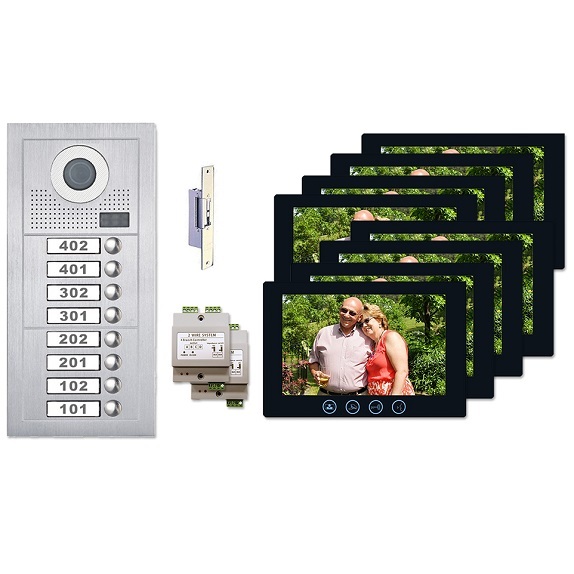 The two wire multi-tenant video intercom system is sure to increase the security of any property. 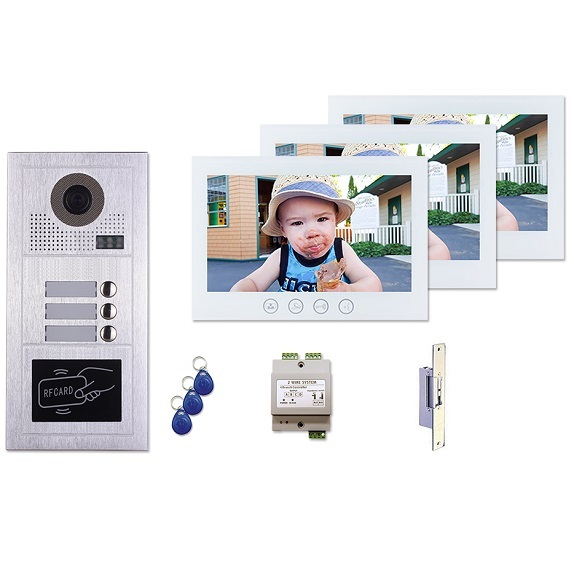 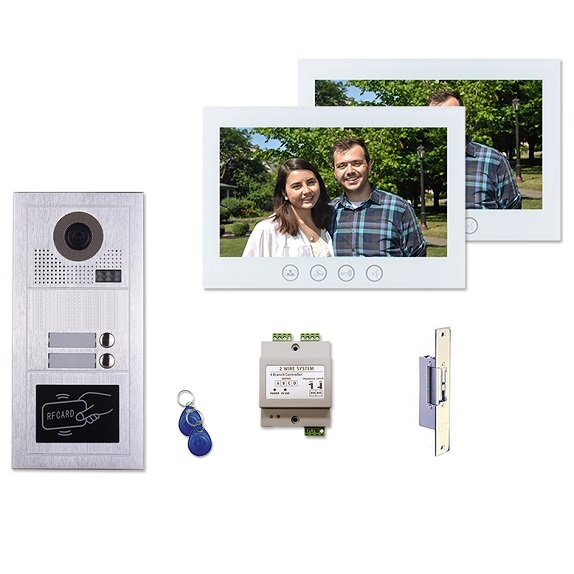 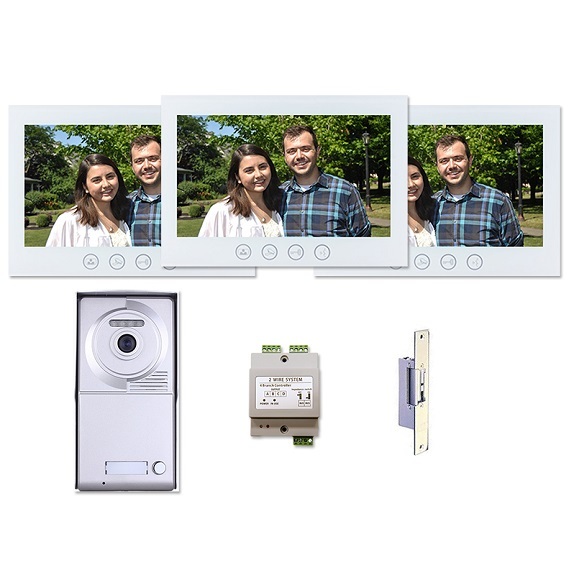 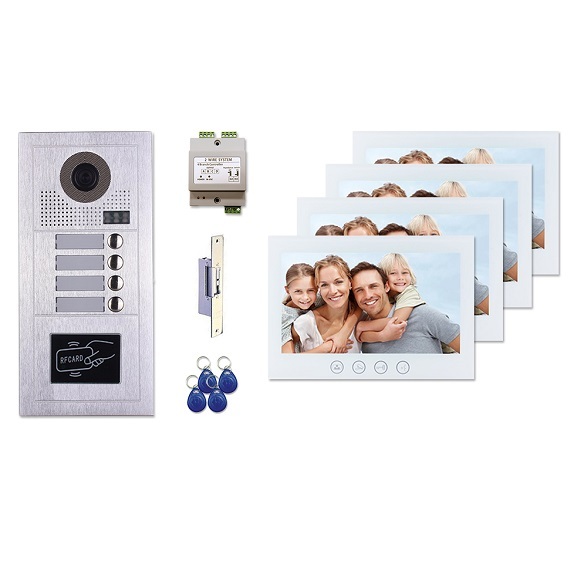 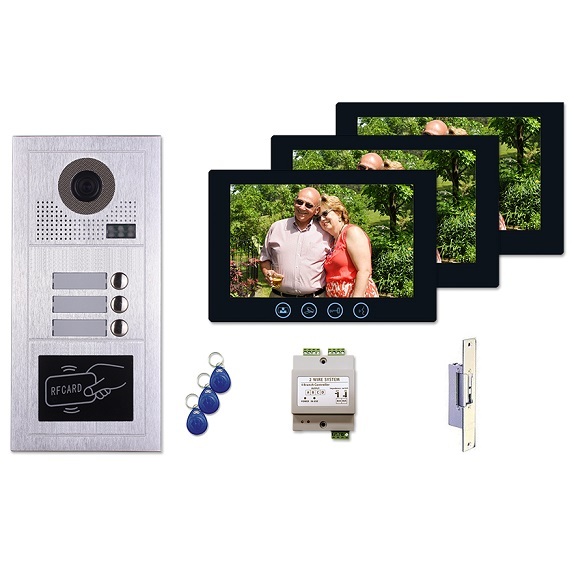 There are numerous features and options to consider when choosing a video intercom monitor for your home or office. 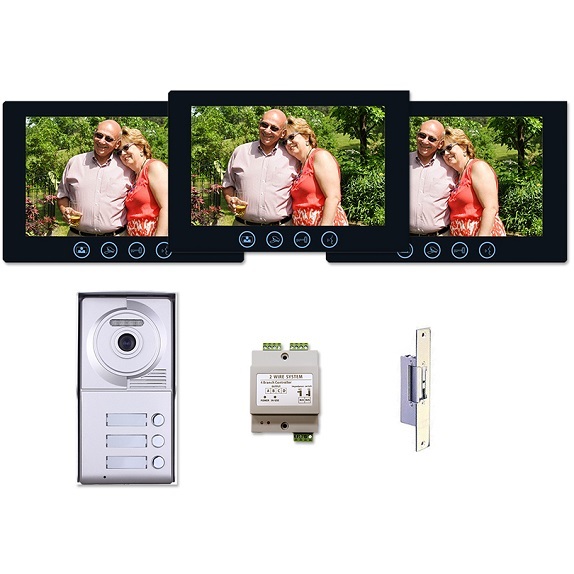 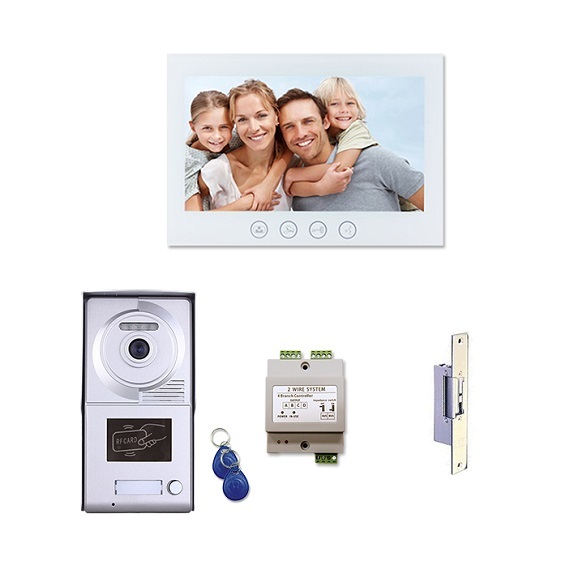 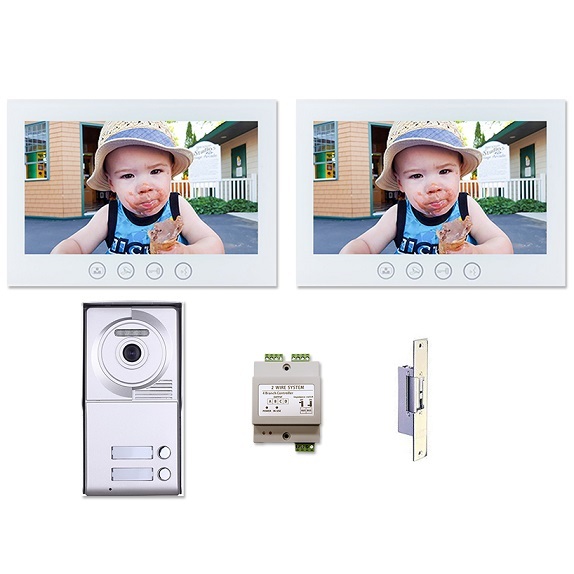 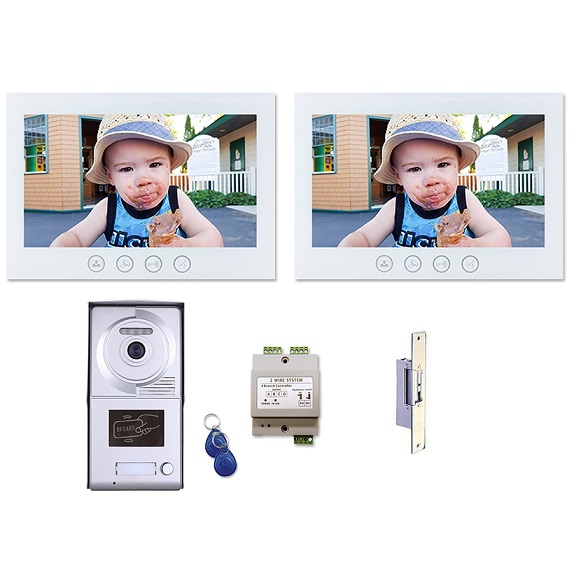 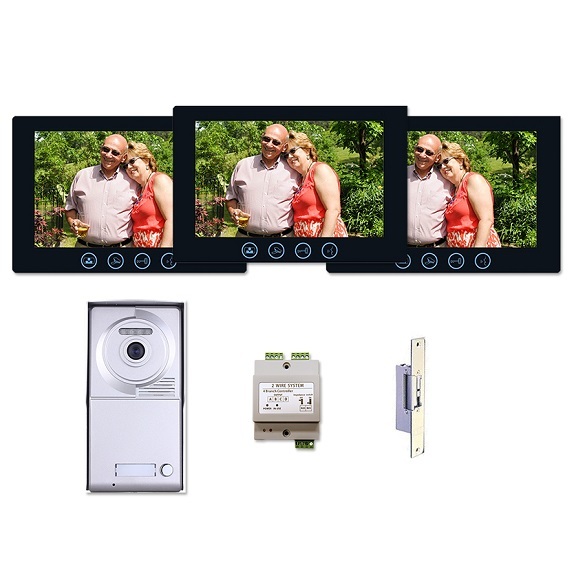 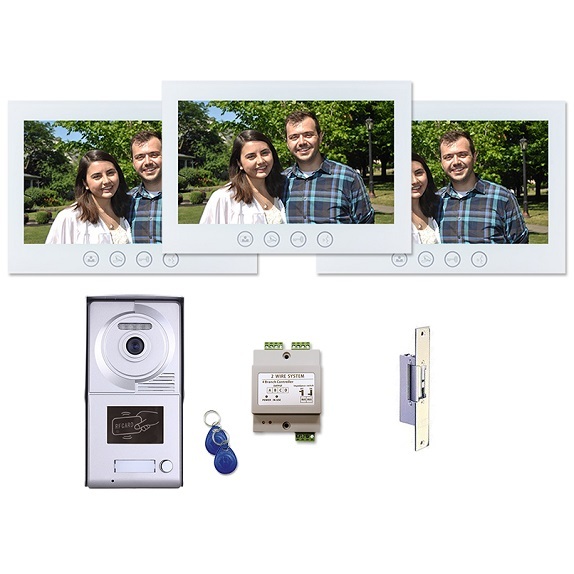 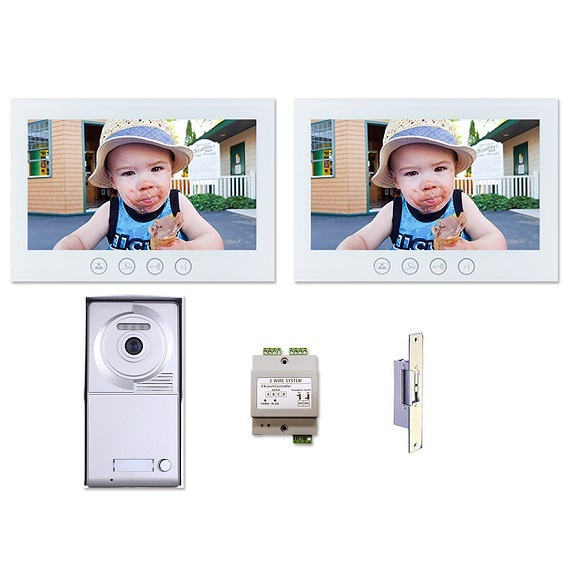 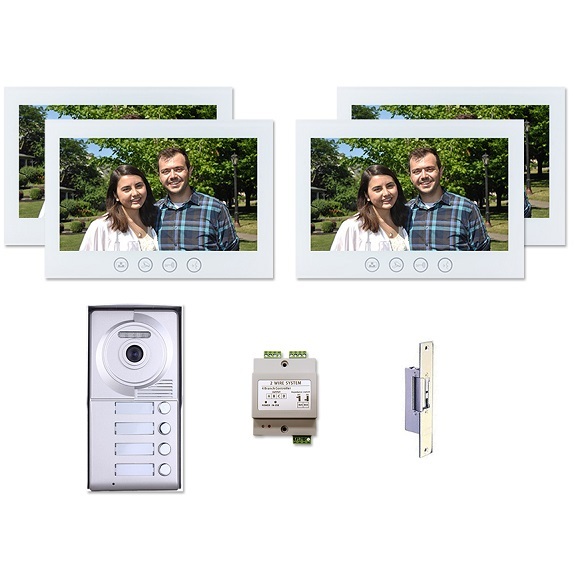 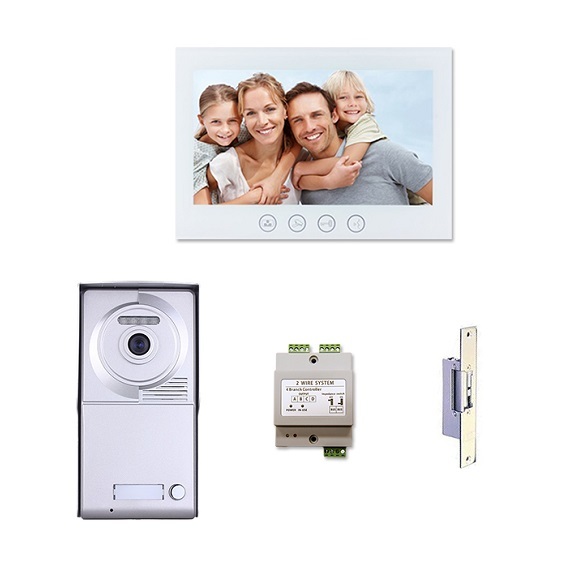 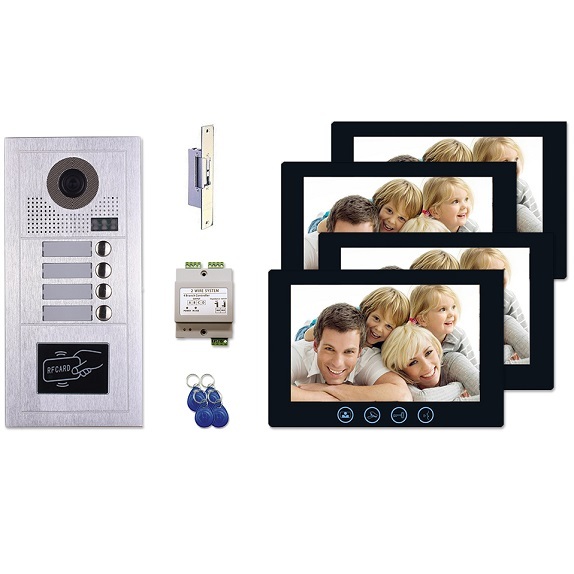 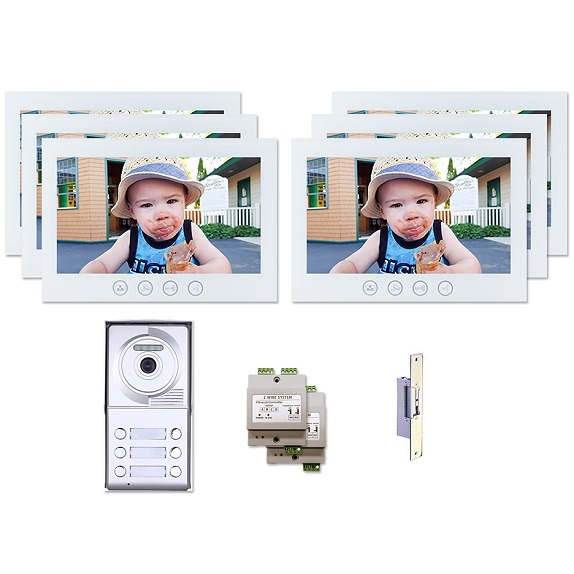 The two wire single tenant video intercom system is compatible with up to three video monitors (per button). 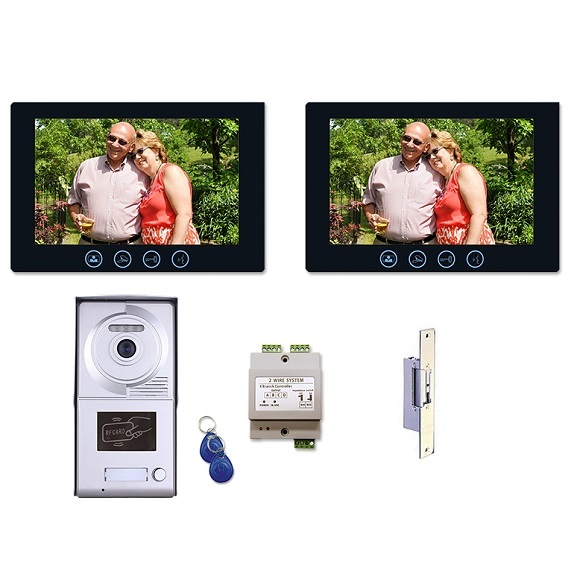 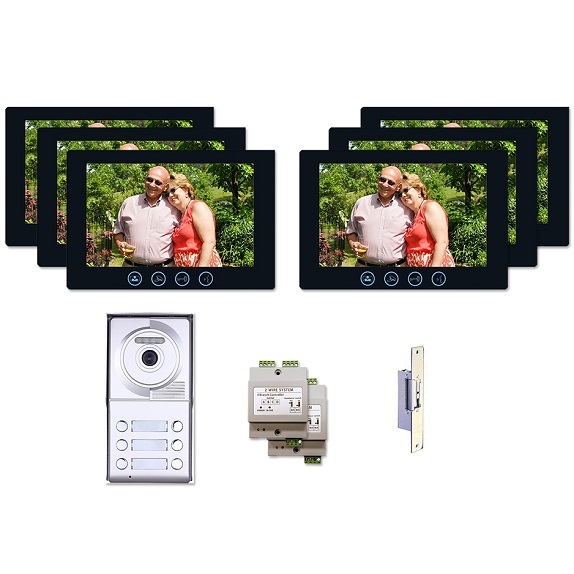 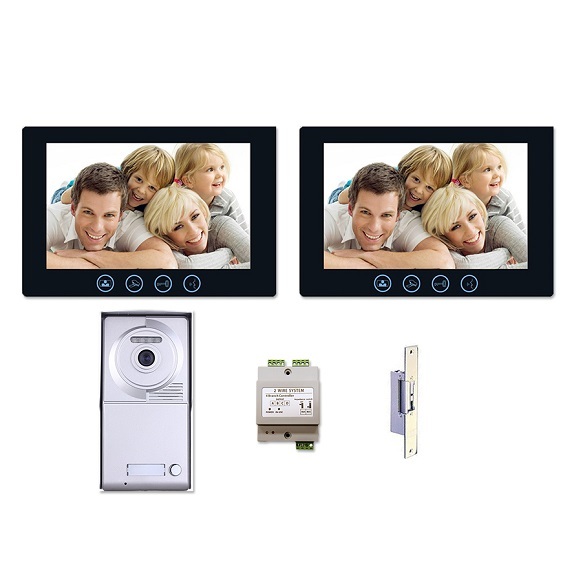 The screen size of the available color video monitors are 7 inches, and they also have auto viewing capabilities. 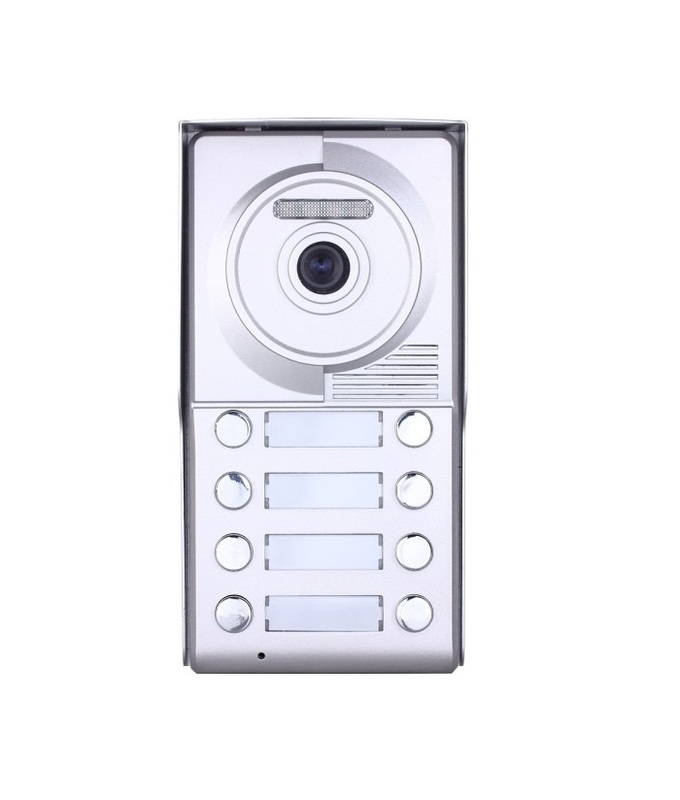 When a resident/visitor/employee requests entry, the monitor viewer can unlock the door using a button on the monitor from a safe, indoor location. 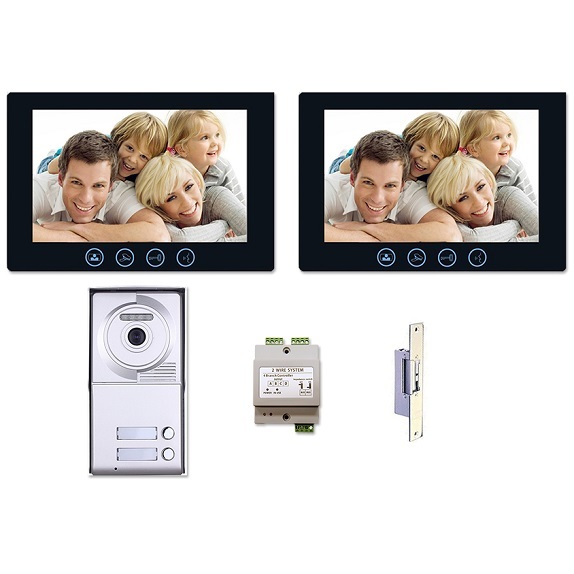 Volume control and brightness adjustments can be made from the monitor as well. 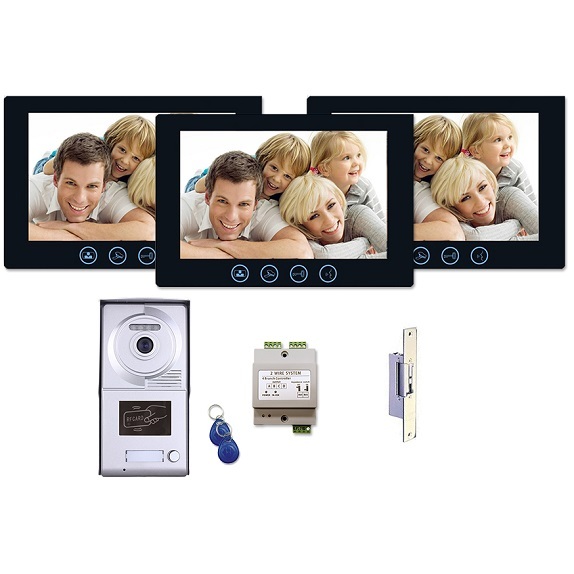 A useful feature on some of the monitors is picture memory. 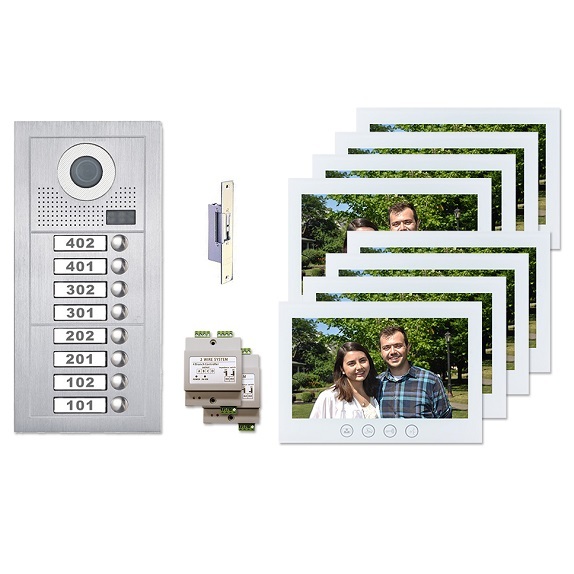 Those with picture memory can save up to 100 of the last photos taken. 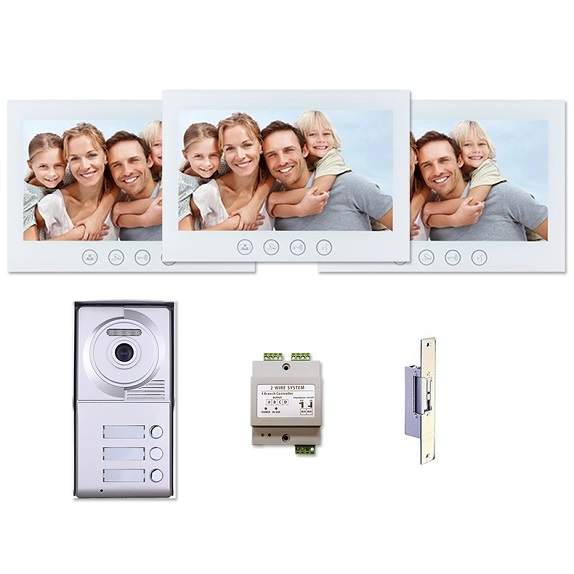 The time stamps and dates are saved along with these photos as well. 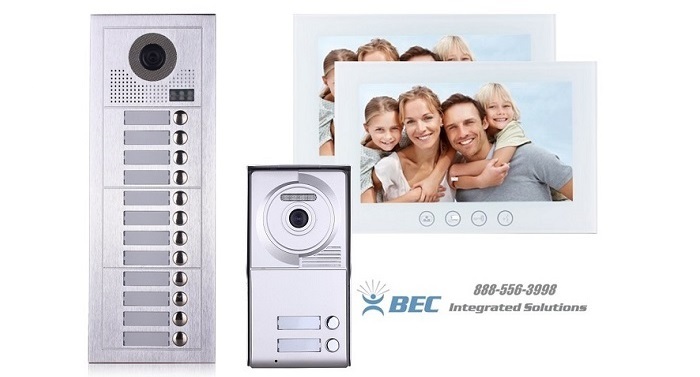 Our two wire single tenant video intercom system offers lobby panels with a single button press to call the homeowner or apartment unit. 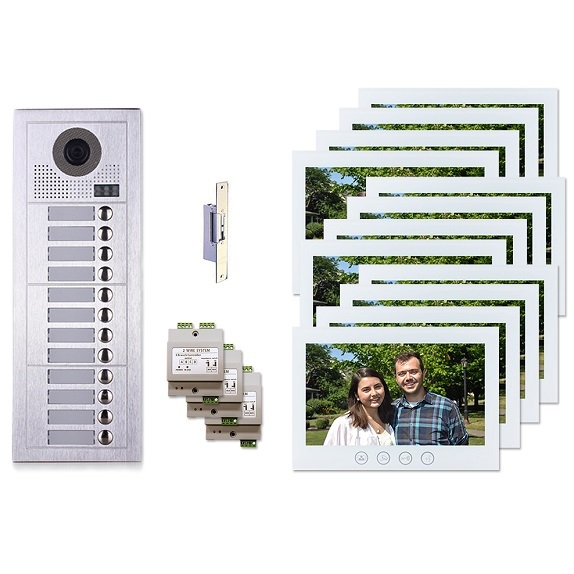 The entry door lobby panel comes with a one, two, three, four, eight, or 12 button panel depending on the number of regular attendees or tenants expected. 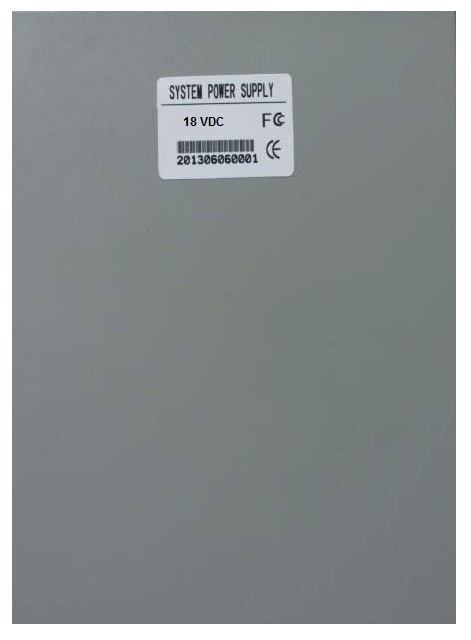 12 or 16 button extensions are available to provide a system for up to 28 tenant unit buildings. 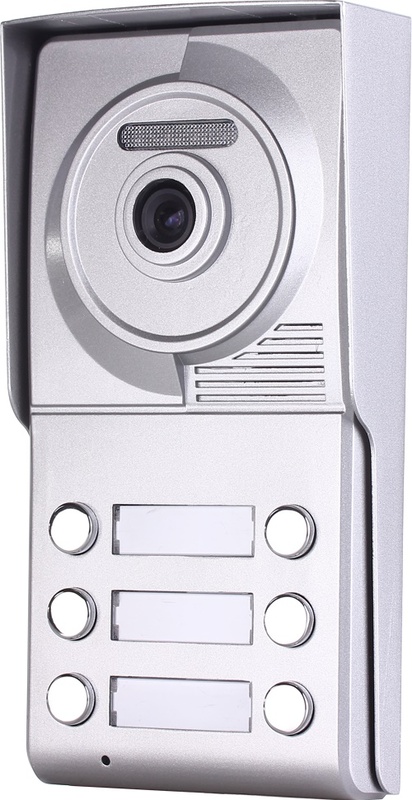 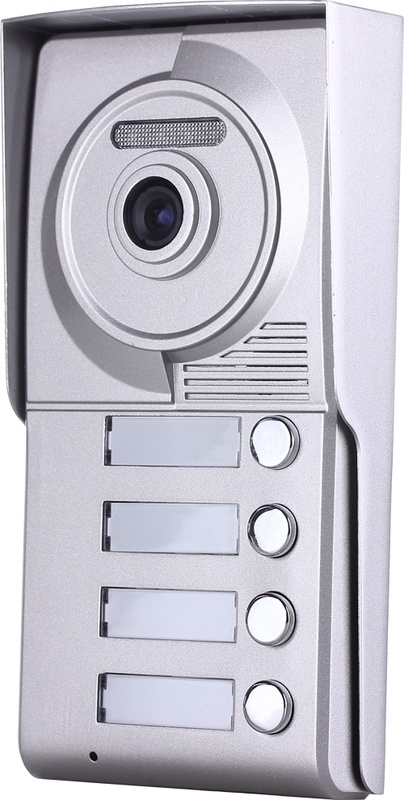 The cameras are equipped with infrared night vision capabilities as well. 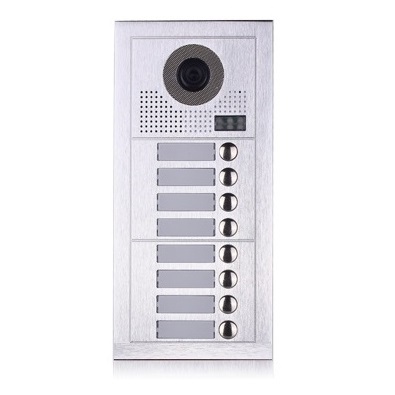 The entry door units have 12 VDC electric strike locks wired to them without the need for an additional power source. Also, low-voltage LED lights are available to be wired to the two wire single tenant video intercom system that will light up during a call.